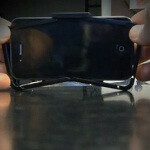 Fresh on the crowd-funding scene we have a solar powered, Bluetooth 4.0 game controller built as an iPhone case. This design looks to be something completely different from what other game controllers have looked like in the past. The FlipSide is in the prototype phase now, and will be thin, have the ability to trickle charge via solar panels, and mountable control pads. What is also cool about the case is that the power is being provided by a very efficient power-cell developed by Infinite Power Solutions. The final product will work with the iPhone 4S, iPhone 5 and have compatibility with the New iPad and iPad mini. Check out the videos below and learn about this case in development. Folks that are willing to get in on the ground floor can pick one up for only $60, and it is a limited edition case to boot. They will ship internationally too. The videos don't do the best job of showing it off IMO. Perhaps because there isn't much to show yet? I'm all for a leading game controller on the iPhone. This just looks awkward and cumbersome though :/. Thats why people prefer Iphones,, great apps... great accessories... well no doubt android is also the best, but we cant deny apple is also the best. Both are great at their ways.